Kzinssie, Subier, Dantarg, Noel, Bokhohn, Rocbouquet, and Wagnas. The Seven Heroes are remembered in legend, said to have once defeated countless monsters to save the world only to vanish soon after. With the belief that they would return one day to save the world once again, it is understandable that their legend would resurface whenever the world was thrown into turmoil. Romancing SaGa 2 is fascinating in many ways, not least for the fact that it has taken so long for it to release on console. First launched for the Super Famicom in Japan way back in 1993, it wasn’t until Square Enix made the decision to remaster the game for iOS and Android devices that it became available in English some 23 years later. Now, after waiting ever so slightly longer, we have the chance to experience it on Nintendo Switch. As someone that had heard of the revered SaGa series but had never played any of the games that it encaptures, it was with an unbridled sense of excitement that I selected New Game on the main menu. Start game with previous data? No. Then there’s the chance to choose whether to play the original version or the updated releases that has additional content. And, lastly, the choice between playing as an Emperor or Empress before naming your character. With all that done, it’s time to start your adventure. Romancing SaGa 2 is a classic in every sense of the word. 16-bit pixel art, turn-based battles, and a rousing soundtrack, it ticks all the same boxes as other games from the time, such as the Final Fantasy series. Now retouched with updated graphics and audio, it’s safe to say that the game has never looked or sounded better. There’s one niggle, though. With Square Enix entrusting ArtePiazza to port the mobile release across with some optimisation and, obviously, button input, it is the game’s modernised dialogue windows and general interface that look out of place. These are at odds with sumptuous sprites, and something that looks worse when played docked in TV Mode. That isn’t a complaint that Romancing SaGa 2 suffers alone, as it is the same criticism that I would have levelled at Final Fantasy IX Digital Edition on PlayStation 4. It is a momentary, if frequent, distraction, seeing as how readily the experience can grip you otherwise. That’s largely thanks to the dynamic freeform scenario system that underpins the game, which, while sounding like a lavish term to pique your interest, suddenly results in a 25-year-old game feeling remarkably fresh to play. With the immediate revelation that the Seven Heroes have turned into demons that now threaten the world’s existence, the player, whose character is sat upon the throne of the Varennes Empire, must lead the fight against them. That probably sounds like a fairly standard set up for the genre, but it’s not. Romancing SaGa 2 has permadeath and once one ruler dies, they have the power to pass their abilities on to their successor thanks to inheritance magic. These moments are unavoidable in the game’s opening prologue, in part foreshadowing what is to come, but it is something that you need to remember. Each character (whether that be your ruler or a party member) have Life Points, which they lose one-by-one each time that they are knocked out in battle after their health depletes. Lose all their Life Points, and death will permanently claim them. That’s not necessarily a problem for the party members that you fight with, seeing as more can be recruited to your side from the ale-drenched taverns, quaint villages, and bustling towns that can visit. The rulers are another matter, though. While you will have the chance to control several generations these are finite, meaning that once the last ruler has been slain it’s game over. For good. 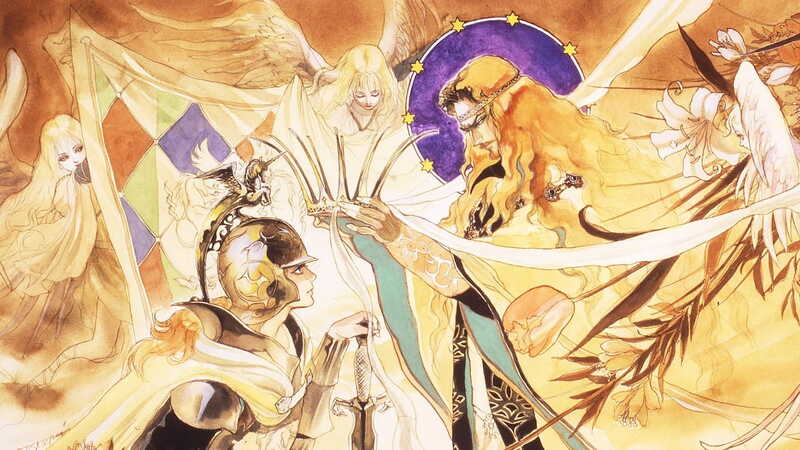 Romancing SaGa 2 will take most players around 25 hours to complete, meaning that this presents some old-school punishment that will understandably prove to be decisive. It’s certainly something to constantly keep in mind as an ever-looming threat, and it is a shame that the game doesn’t do a better job at explaining the intricacies of its systems. With enemies stomping around in the environments that you wander, when your sprites clash the game immediately shifts into battle situations. These are fairly standard turn-based encounters, but you can choose to have your party stand in different battle formations that will lend them offensive and defensive advantages. If an enemy attacks you from behind though, your formation breaks – leaving your party in a weaker state for the battle’s duration. Surprising, to me at least, Romancing SaGa 2 also has you rebuilding your kingdom. Optional objectives can see you reclaiming areas from the monsters that have infested them by vanquishing their leader, or you can choose how to spend crowns deposited to the Imperial Treasury – whether that be to create new items or equipment or to build a research lab to discover magic. The choices that you make with these will impact the rulers in successive generations, meaning that every decision counts. With new character classes in Ninja and Diviner, The Maze of Memory as a new dungeon that further explores the mysteries that surround the Seven Heroes, the chance to earn some extra income with The Avalonian Gardens, an additional scenario in Emerging Victorious, and a New Game+ mode to carry everything over into a second run, it certainly can’t be said that this is an unattentive port nor that there isn’t enough content to sink hours into.